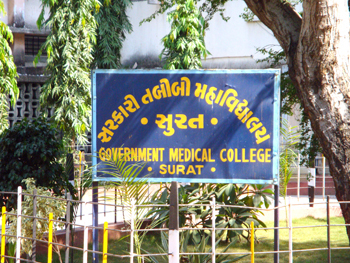 Government Medical College, Surat was started in June 1964 with 70 students batch called ‘A’ batch in an old building at present campus by Government of Gujarat. Construction of the new college building was also started in same year. Initially old civil hospital and Maskati general hospital Surat was affiliated with college. New Civil Hospital was constructed soon after. Under leadership of first Dean Dr. J. D. Pathak (Professor Of Physiology) college started to take shape. Majuragate being a remote area at the time. Campus looked quiet in evening because of lack of good roads. In those days,It was difficult for students during rainy days to attend the college. Medical council recognition came after 4 years and before that students had to go to B J Medical College, Ahmedabad for last year of studies. Post graduate courses in various departments were started from 1973-74 before that students had to go to B J Medical College, Ahmedabad & Govt. Medical College, Baroda for post graduation. In the beginning medical teachers & other staff looked after students like a family because of small numbers. After 1970, there were increased numbers of medical teachers & seat for U.G. students were increased to 100. Hostel facility for students, staff quarters and good roads in the campus were constructed after 1970. As the college grew in number there was decrease in teacher-student interaction as compared to previous level. At present GMCS completed 39 years. Most departments of this college are developed with post graduation facility.